Ceramic cookware refers to clay pots and pans that are kiln-baked and specially glazed. It also denotes pots and pans made of aluminum or some other metal that are coated with a ceramic enamel. It's often the choice of home cooks as it is resistant to scratches and chips. Both kiln-baked/glazed and ceramic-enameled cookware have pros and cons. 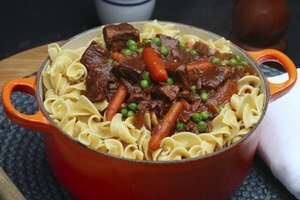 A basic understanding of each can help determine the best form of cookware to use for a variety of culinary purposes. If you are in the market for ceramic cookware, it's best to remember to "buy American." 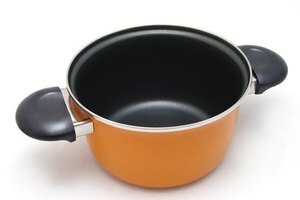 Ceramic glazes contain lead, but larger American companies manufacture ceramic cookware according to FDA specifications, meaning the cookware is safe for food preparation. Alternatively, foreign-made, craft-produced or old ceramic cookware carries the risk of high lead levels. As a result, that type of ceramic cookware should be reserved for decorative purposes only. To reduce the risk of any lead transference, don't expose your ceramic cookware to acidic foods (acid increases leaching) and replace dishes periodically. Ceramic cookware generally works best for baking or serving. 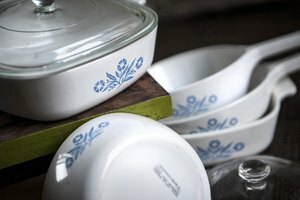 Choose from casserole dishes, mini ramekins and soup tureens to name a few. Touted as "green" cookware, ceramic cookware is a recent innovation in the nonstick cookware trend that began in the early 1960s. It refers primarily to pots and pans with ceramic-coated cooking surfaces. Traditional nonstick pans have toxic coatings that aren't environmentally friendly or healthy; thus, the "green" connotation with less toxic ceramic cookware. 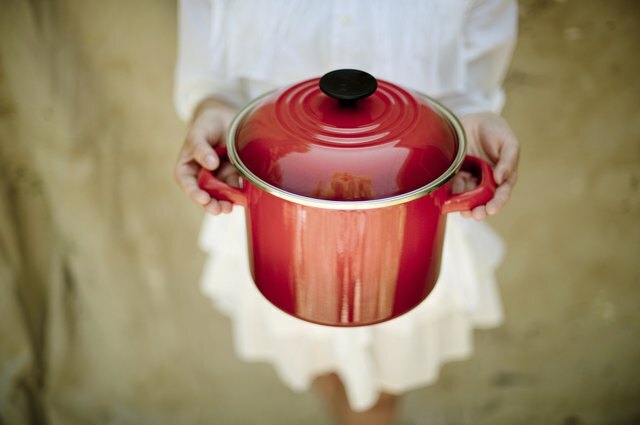 Just like traditional nonstick cookware, ceramic cookware reduces the need for oils and other fats when cooking. However, ceramic coating is fragile and prone to chipping. Manufacturers recommend hand-washing, using plastic or wooden utensils and allowing coated pans to cool before introducing them to hot water. If you use your ceramic cookware daily and care for it properly, each enameled piece has an approximate shelf life of three years.